Handicapped Showers : Need it Now ? Sometimes time is of the essence when it comes to installing a handicap shower stall. The job may need to be finished quickly or the homeowner doesn’t want to mess with the difficulties of DIY. That’s why you have our Need It Now Shower Packages, which are practically ready to go… just add water! There are so many variations on our handicap shower stall kits that it’s almost like they are custom made. Need It Now shower stalls are pre-leveled with a no-caulk brass drain, and entry thresholds lower than 1.25” are reinforced with steel studs. They use a top-quality Symmons handheld shower and valve. 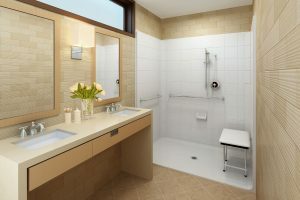 These handicap showers also have full plywood backing and tile-like design with a beautiful gel-coat finish. The stall walls literally snap together with our innovative leak-proof joints. You also get grab bars, a fold-up seat, a shower curtain and rod and a WaterStopper kit. 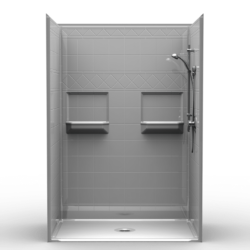 All of our handicap shower stalls come with a 30 year limited warranty. And, true to its name, Need It Now Shower Packages are processed and shipped within 24 hours. We offer free shipping with a tailgate service. If you live in Greater Vancouver/Lower Mainland, we can even install the shower for you. 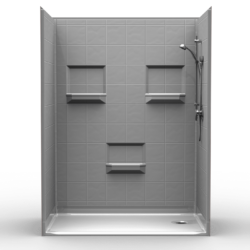 Need It Now barrier free handicap shower stalls save you time and effort when it comes to installing, but we never skimp on quality. Showers sold by ORCA can be ordered fast but they’re built to last. Next Next post: Tile Shower, Go Away!